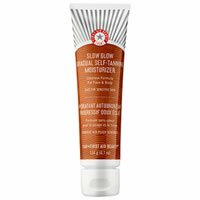 Comprehensive review of First Aid Beauty Slow Glow Gradual Self Tanning Moisturizer. See what real experts and actual users have to say about this self tanning product. I really wasn’t impressed with this self tanner, so I gave is 1.5/5 stars. The only thing I really liked was the lack of scent when you first apply it, and it dried rather quickly (about 20 minutes). Everything else was a disappointment to me. For starters, the 4.7 ounce bottle only lasted me 3 applications, which is ridiculous. This is a gradual self tanner, so you’ll need to apply it at least 3 times per week, which means you’ll use at least one bottle per week. That becomes very expensive and time consuming. Now, after applying it 3 days in a row, I still had virtually no tan. I was very let down with the lack of color this lotion gave. I think it contains miniscule amounts of DHA, so it’s more like a moisturizer than it is a self tanner. I don’t think it will even work on very fair skinned people. The almost invisible tan I got (probably about ½ shade darker), only lasted a day. So unfortunately, I can’t recommend First Aid Beauty Gradual Self Tanning Moisturizer. This is a gradual self tanner that looks and feels much like a normal body lotion. It’s white in color (no guide), and has a slick texture. It’s not too thick, but not thin either. Applying First Aid Beauty Gradual Self Tanning Moisturizer is very easy; I didn’t even use a mitt. You just rub all over your body like you do a moisturizer. The bad thing is, I used up SO much product per application. The whole bottle only last me 3 applications. This is a gradual tanner so you’ll need to use it at least 3 times per week, which makes it SO expensive to maintain your tan using this product. The lotion dried on my body in about 20 minutes. After it dried, my skin felt a little wet, but overall pretty smooth and soft. This one truly has no smell, which I like. A lot of self tanners out there claim to have no smell, but they really do. With this one, I couldn’t smell anything. The next morning, I could smell a tiny but of a sour smell. It wasn’t bad at all, I had to really sniff to smell it. This is where this self tanner really fell short. Now, it says right on the bottle that it’s a gradual self tanner, so I expected to have a tan after a few applications. Boy, was I wrong. After 3 applications, I literally had no tan…I was MAYBE half a shade darker. I was really disappointed that I spent all that time applying it each night for no tan. I think this product is more of a moisturizer than it is self tanner. If you’re looking for a visible tan, I would recommend staying away from this one. I don’t even think it will work for the palest of pale people out there. Well, it’s hard to say, as I never really got a tan. The half shade I had faded after one shower. So I’d say it lasted maybe one day? No. I don’t think men will like the lack of color this self tanner gives. Plus, it becomes very expensive to use! First Aid Beauty Gradual Self Tanning Moisturizer is $28 per bottle. But one bottle only lasted me 3 applications, so you’d need to buy about 4 bottles per month, which is ridiculous. To buy First Aid Beauty Gradual Self Tanning Moisturizer, Click Here. Look and Feel This is a slick, white lotion. Application Applying is easy, but one bottle will only last you a few applications. Smell (Before) Smells like nothing at all. Smell (After) Smells a little sour the next morning. Color Produced I didn’t get any tan at all after 3 days! How Long It Lasts It lasted about 1 day. Price It’s only $5.96 per ounce.